Rudolf Elmer, the Cayman-based Swiss whistleblower who went to prison after spilling secrets relating to the Swiss bank Julius Baer, has long been victimised not only by the Swiss banking establishment, and Switzerland’s courts (which as we’ve extensively documented, seem to have played fast and loose with the law in order to nail him) – but also by much if not most of the Swiss media. In Switzerland he’s been demonised as a traitor and a criminal, and jailed too. Such is the fate of the offshore whistleblower. Elmer’s case rumbles on, and a verdict is expected to be announced publicly at the Higher Court of Zurich on August 23, at 14.00 PM. Strikingly, they also accuse the public prosecutor of malpractice. The article focused on two of Elmer’s court trials at the High Court in Zurich, on June 23rd and 24th, which we wrote about. This two-day event was a peculiar combination of two cases against Elmer: one, for handing data to the Swiss authorities; and a second one, for apparently handing over data to Julian Assange of Wikileaks in 2011. The evidence shows that in neither case did he break the Swiss banking secrecy law — but the Swiss courts went after him in any case. In other words, Elmer writes, the prosecutor himself admits that not only the Prosecution Office, but also Julius Baer bank, have either deliberately or accidentally hidden crucial evidence from the judges of the Lower Court and the Higher Court of Zurich — and this, for over 11 years. The case has other strange aspects too. In the Swiss legal system, prosecutors are part of the executive branch of government, while judges of the high court are part of the judiciary. But in Elmer’s case, there appears to have been a blurring of the lines. There has been a re-investigation of the facts of Elmer’s case (involving 20 binders full of evidence, including international legal assistance requests, and an expert report by the Institute of Comparative Law about Cayman and Swiss Banking Laws.) This investigation was supposed to be carried out by the executive body, but instead it was, Elmer writes, “guided and supervised by the judges of the High Court of Zurich.” This may seem arcane but it penetrates the very bedrock of the separation of powers between the executive, the legislative and the judiciary. 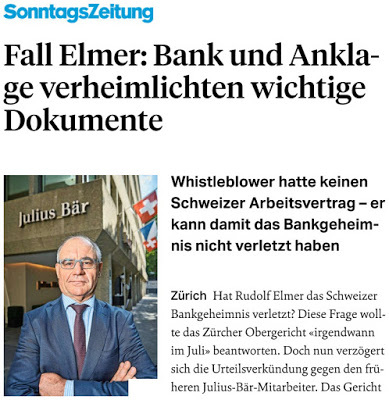 Rudolf Elmer “could become the first whistleblower in Switzerland who cannot be found guilty under the Swiss banking secrecy laws after releasing information about the dubious practices of Swiss Private Banking. Here’s hoping that this case will do lasting damage to the Swiss secret banking establishment.